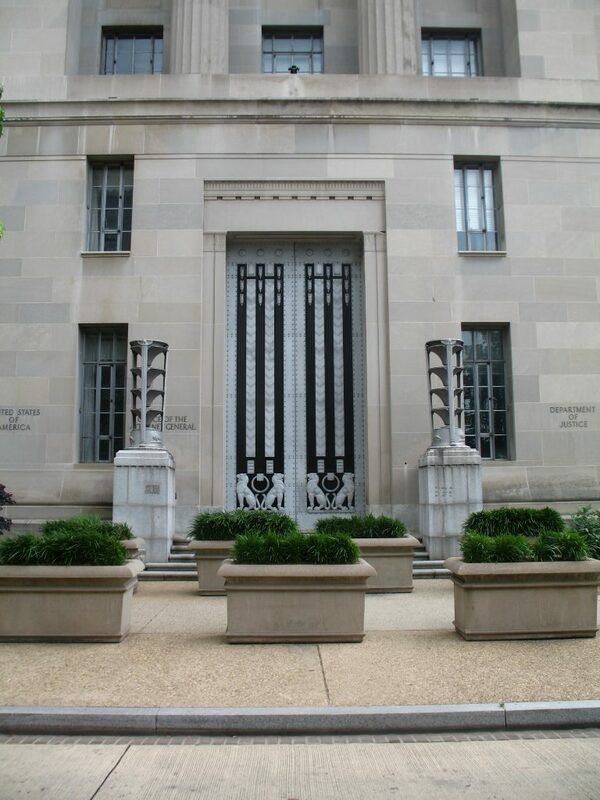 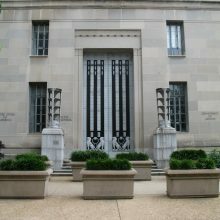 The US Department of Justice building was built between 1933 and 1935 as part of the Federal Triangle development known as the McMillan Plan. 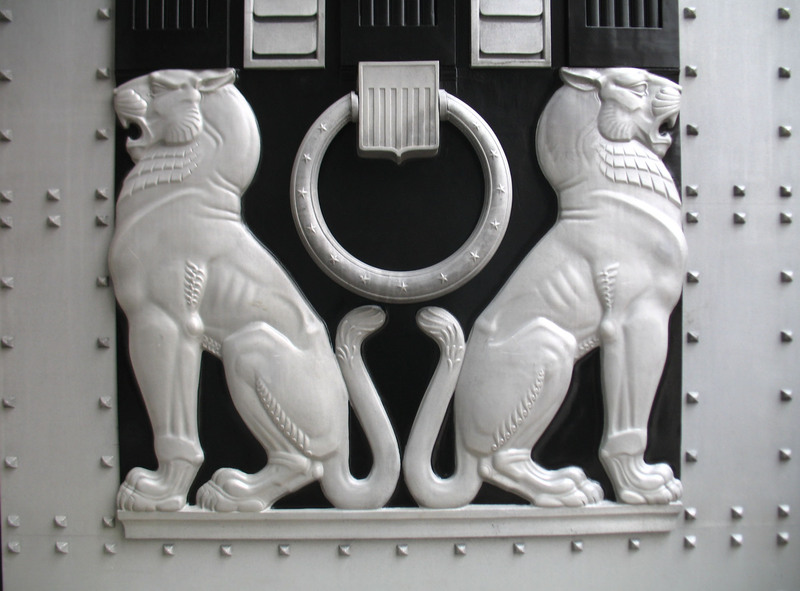 The Beaux Arts building covers the block between Pennsylvania and Constitution Aves and 9th and 10th Sts. It is richly decorated with murals, sculpture and architectural metals in aluminum, an uncommon and expensive choice for the time. 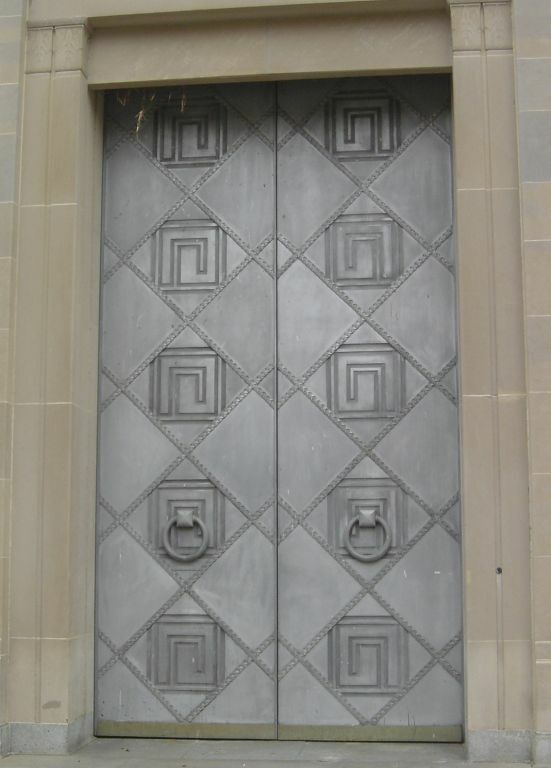 The most impressive and visible elements of this scheme are five sets of monumental night doors, designed by the sculptor Carl Paul Jennewein and sited at the main building entrances. 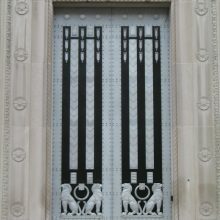 Each door features either a Greek key pattern or abstract, heraldic lions. 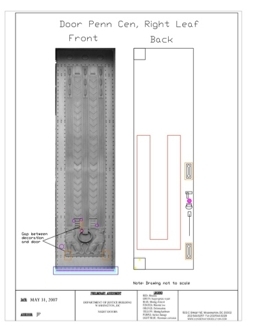 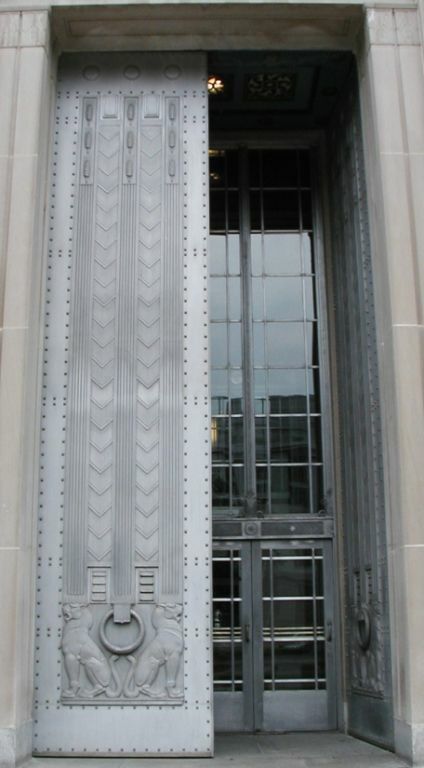 Years of exposure caused pervasive corrosion across the face of each door and the use of de-icing salts generated severe deterioration of the metal near the ground. 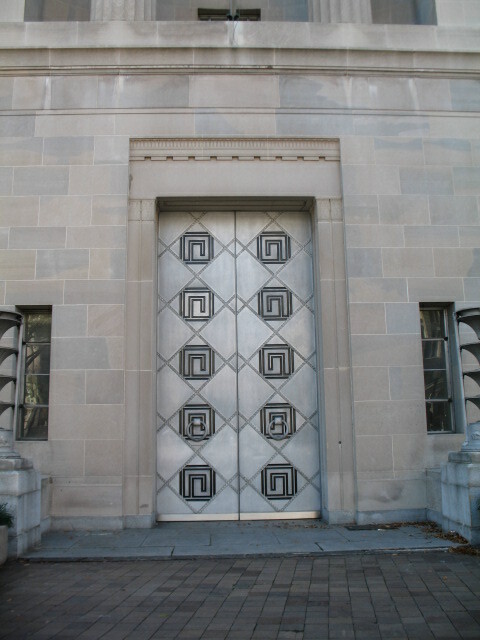 Aggressive re-treatment, vandalism, and accidents created unsightly surface abrasion and loss of finish treatments. 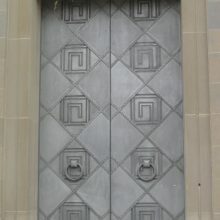 Decorative nickel silver trim was deformed or missing entirely. 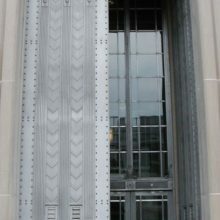 All hinge and lock hardware required replacement after 80 years of continuous use. 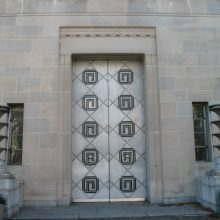 We were contracted by the GSA to conserve these doors in 2007. 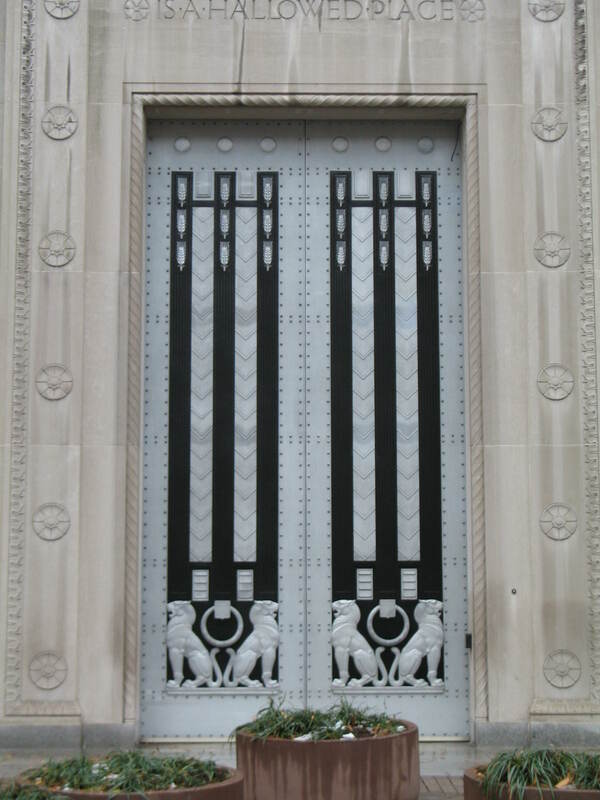 Working with a metal restoration sub-contractor, we developed means to clean, brighten and protect the aluminum, replace and upgrade all hardware, and restore the doors to their original condition. 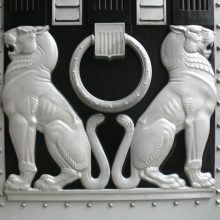 The original decorative paint and finish scheme was researched and re-created. 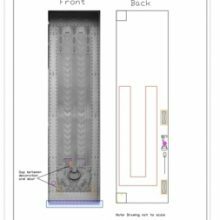 We also developed a coating system that allowed the lacquer top coat to be field maintained without disturbing the underlying painted design.